I have been struggling, trying to decide if I liked the colors for the next quilt that I want to make. I used colored pencils on graph paper, I played with fabric on my design wall, and finally I got the idea to cut out some fabric and make a mini version of the quilt. Now that worked well enough that I am starting to cut out fabric next. Here is a picture of my next quilt, in a mini draft, leaning up on the stacks of the fabrics I have chosen for the quilt. There will be 10 shades of blue in one ribbon and 10 shades of purple in the other ribbon, with white for the background. Great idea. You've shown yourself the path you want to take and now will be happy as you create. Much better than just plunging ahead and then second guessing yourself the whole time. Now you can just enjoy the process. Did you just cut pieces to approximate the layout? Sort of. I made a copy of the pattern...and then I cut out pieces of fabric and taped them to the parts I was wondering about. Oh WOW! That is going to be beautiful. Love those two colors together. Please share with us on your progress. If it purple and turquoise (that is what my computer shows the colour as) then there is never a question in my mind but that it will be gorgeous. I have drawn out a couple of patterns and used colour pencils to colour them. If it is a complex pattern it also helps me to understand it and to remember it. I save them in a binder with other notes. yep, my colors. 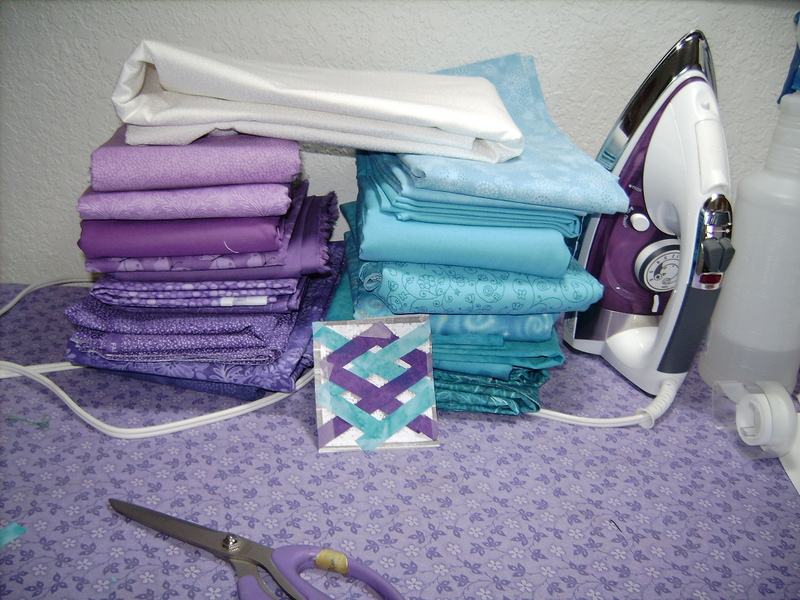 i hope to make a purple quilt soon. maybe with turquoise.... maybe not. looks like it will be wonderful though! Lovely colors, great pattern. What's not to like? I am looking forward to seeing the finished product. "You don't really know how it's going to look until the pieces are cut and next to each other"
More than once I've had fabrics in bolts looking great together, but then I was not thrilled with them when I had them made up into blocks. Is the pattern one you purchased? It looks quite intricate.....what will the size of each block be. Will,you use all 10 colors in each block, like a DWR? I went to a local fabric store on Saturday and came home with 10 fabric pieces=you guessed it= purple and turquoise with touches of green. Can't miss color scheme. I like your idea of choosing a pattern for your lovely fabrics. Keep us posted! Yes, the pattern is called X Factor Bargello. One ribbon will have 10 shakes of purple and the other will have ten shades of turquoise. It is a complicated pattern, and I still havn't decided for sure on my purple fabrics. I will make that decision today. Fun, fun, fun! Looks great !Please post when finished. What a great idea! I've put fabrics together in all sorts of configurations in trying to figure out if I like them together, but I've never actually made a mini version of the quilt. It looks like it will be great! Clever way to audition your fabrics! It's going to be wonderful! Love the colors. When your quilt is complete, please show us a picture?? Color choices are great and I love the block. Please keep us updated and post pics! Is that what one block will look like, or what the finished quilt will look like? My mind doesn't seem to want to "compute" what I am looking at. I hate aging!!! I absolutely love your color combination! Can't go wrong with purple and turquoise. Ir will be stunning when done! I, too, have drafted blocks and then colored them with colored pencils or crayons. When I am working on a complex pattern, I've also enlarged and copied the pattern, then colored in the blocks with whatever colors I am planning on using. Helps me keep the colors straight in the pattern. My mini-quilt is just that....it isn't a block, it is what the whole quilt will look like. It will be queen sized... Each ribbon will have ten shades of the color. Google X Factor Bargello quilt and you will see it in black and red. I really like it in red and black, but I have a red and black Bargello that I designed already. That is why I was relieved that my turquoise and purple colors look good in this pattern. I am in the process of cutting out 180 2 inch x WOF fabric strips! !